Byoona Amagara is a SUSTAINABLE COMMUNITY DEVELOPMENT project focused on Education, Agriculture, Healthcare, Tourism and Entrepreneurship. Byoona Amagara got its start in 2001 when Jason Gerber, a backpacker from the USA, arrived at Lake Bunyonyi, met many local people - teachers, farmers, students, headmasters, business and community leaders, et al., and together with a focused group of them conceived the notion of establishing a locally-owned community resource center where future development at the lake could be given the promise of sustainability and where it's rapidly growing tourism industry could be a given a new face and sense of responsibility. The project empowers the lake's citizens and welcomes them amongst the foreign guests that are attracted to this stunning land. Early on it was recognized that the inseparable linkage of economy, ecology, education and culture was being sorely neglected in the many new tourism projects at the lake, and that an integrated approach could be implemented in the near term to serve both as an example for future planning and for the immediate needs and wishes of the community. Thus, the programs at Byoona Amagara are aimed at providing lifelong learning and new opportunities for local citizens, in a comprehensive manner, each touching on all the areas that contribute to a productive and thriving existence for all, for now and in the future. The name 'Byoona Amagara' translates loosely as 'the Complete Life' in the Rukiga language, the native tongue of the local Bakiga people. 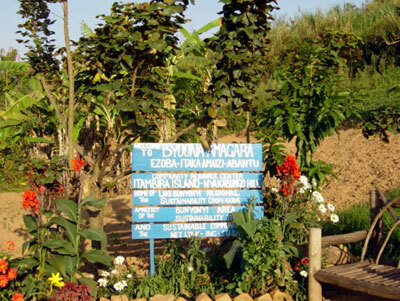 Our motto, "Eizoba, Eitaka, Amaizi, Abantu", translates as "Sun, Soil, Water, People". Use of these phrases to represent our project is intended to reflect the harmonious and integrated nature of the various aspects of daily life at Lake Bunyonyi, and the approach we take to our program planning. Lake Bunyonyi is often referred to as "the most beautiful lake in the world", and is the second deepest lake in Africa. It sits at 6450ft/1950m above sea level, and lies almost directly on the equator at 1.1 degrees south, to be exact. It is a land of incomparable beauty, as well as of endless challenge, constant hope and delicate balance - and is home to a most friendly, vibrant and industrious community of people, the Bakiga, who live in daily harmony with the land and water. All visitors to Lake Bunyonyi are welcomed with open arms and a smile.